As members of Disney’s Vacation Club (DVC), we had received a welcome packet in our stateroom. This included a small gift (a captain’s wheel pin in a nice wooden box) as well as an invitation to attend one of two DVC member receptions. The promise was that members would get another free gift at these events as well as hear some current DVC and Disney company news. Yeah, this was obviously going to be primarily a sales pitch, but we had a little time to spare after breakfast and realized we could make it for the last 20 minutes or so of the reception. We figured we might as well at least get the free gift. The reception was held in one of the lounges in The District. When we arrived, we were met outside by a DVC representative who took down our name, gave us the free gifts, and provided us with a form to fill out with our name and other demographic information. 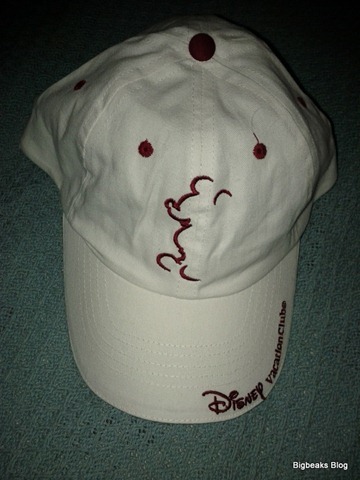 The free gift was a reasonably nice DVC baseball cap and they generously gave us three of them, one for each member of our party. The form actually turned out to be the entry form for a drawing for an onboard credit that they were holding at the end of the reception. We didn’t realize, though, and didn’t get our form turned in early enough to be included in the drawing. From the agenda that they had up on a screen in front, we could tell that the first part of the presentation was a general overview of big upcoming Disney projects, including the new movies, park attractions, and such that were planned for the upcoming year or so. We had actually missed that part, though, and were only able to hear the last part of the sales pitch. 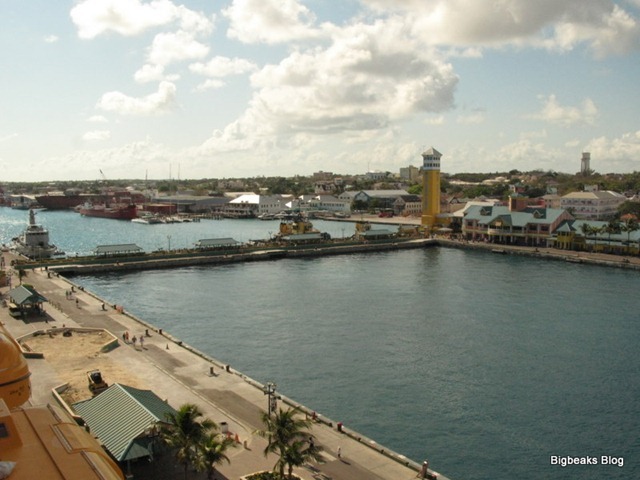 They were offering some pretty decent prices and incentives for members that wanted to add on additional points to their membership while on the cruise. We weren’t interested in adding to our membership at that time, so it wasn’t really that interesting to us. I guess the 20 minutes or so of time wasn’t a bad investment to get the free gifts, though. After the reception, we still had some time to kill and decided to try out the miniature golf course on the sports deck, located towards the top of the ship on deck 13. 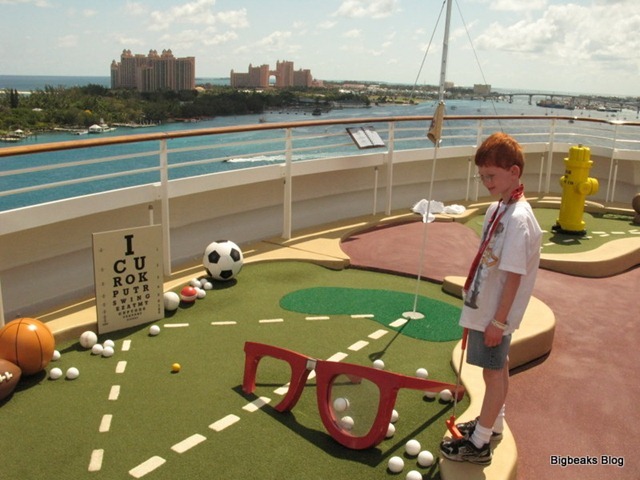 We thought the inclusion of a 9-hole miniature golf course on a cruise ship was an interesting novelty, so it was something we were interested in checking out. The entire sports area is billed as Goofy’s Sports Deck and the golf course is described as having been designed by Goofy and his son Max. The design is whimsical (and silly) as you would expect, with lots of strange twists and turns as well as oversized, cartoonish obstacles. It is all really very cute. One particularly nice touch is that every hole has two tee points, one labeled "Goofy" for adults and an easier one labeled "Max" for children (or, I suppose, less skilled players). Clubs and balls are freely taken from bins at the start of the course (and left in bins at the end), so there is no need for a check-out counter or anything like that. Playing is simply first-come, first-serve, but the area wasn’t crowded when we were there, which meant we really didn’t have any significant waits. I would imagine that it is probably more crowded during a day at sea or in the evenings when everyone is on-board the ship. Goofy was actually playing golf at his course. 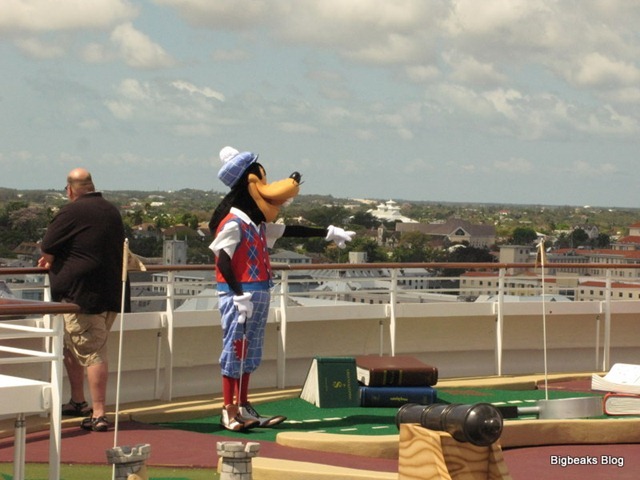 At the time we were there, Goofy was actually there and had joined the game of the family in front of us. While we were a tiny bit disappointed we hadn’t gotten there a few minutes earlier (so that Goofy might have joined our game), it was still a lot of fun to watch and it did add a nice touch of extra Disney magic to our game. After our golf game, we decided we really needed to eat a quick lunch before time for our excursion, although we weren’t overly hungry as it hadn’t been that long since lunch. We decided that the best choice was to grab something quick at the Flo’s Café set of Cars-themed fast food windows on deck 11. 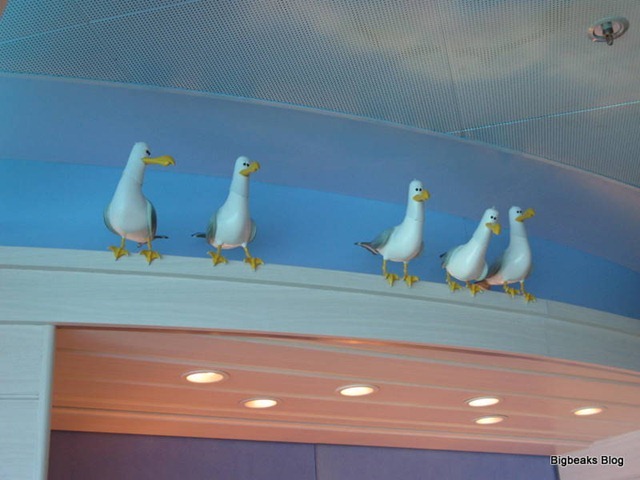 Like most food service options on the ship, the food there is offered at no additional charge. We first decided to each get a slice of pizza from Luigi’s Pizza. The available choices here are cheese, pepperoni, BBQ chicken, or vegetarian pizza. All three of us selected pepperoni. The slices are relatively small and generally kind of flavorless. 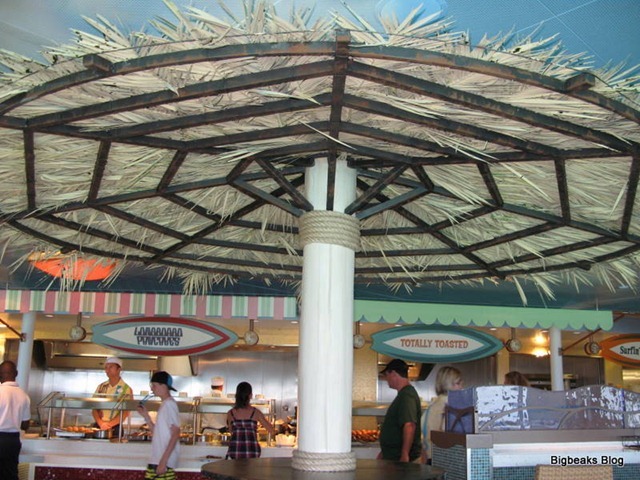 We though they were pretty typical of the fast food pizza found at most Disney theme parks: edible, but not much more. One slice of pizza was enough for our son, but my wife and I were still a bit hungry and we each decided to get a bratwurst sandwich from Tow Mater Grill. It has been long enough since I lived in Milwaukee that I now have pretty reasonable expectations when I order a bratwurst and this one wasn’t too bad. I suspect that this is one of the better choices of the fast food offerings. That window also offered burgers, chicken strips, chicken sandwiches, and hot dogs as well as fries to go with them. The other fast food window in this group is Fillmore’s Favorites, which offers various sandwiches, wraps, and salads. We didn’t try anything from this window, but it looked like a decent selection. For the most part, I thought the variety of options at the fast food windows was pretty good. Don’t expect the food quality to be nearly as good as what you can find in the major dining rooms, but it isn’t a bad option when looking for a quick meal or snack.